We were not exactly excited about our trip to Dinosaur World. I had five girls with me from age 10 to 15. None of us are particularly big fans of dinosaurs. But guess what happened? 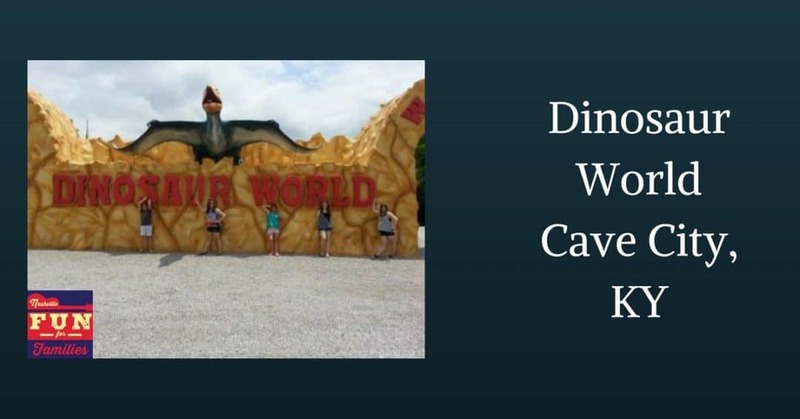 Dinosaur World has three locations. We visited the one located in Cave City, KY. When you enter, there is a large gravel lot in front of the admission building so parking is no problem. Once inside, you can purchase tickets. This building houses a large gift shop. There are toys, statues and stuffed animals available for purchase. Beware! There is also quite a few delicate items on display. If you are into paleontology, these will be highly interesting to you. But if you are taking a group of rowdy kids with you, I would send an adult in to buy tickets and then walk the kids quickly through the shop without stopping. Trust me. There will be plenty of non-breakable stuff to captivate them once you head outside. As you walk out of the admission building, there are signs leading to different attractions throughout Dinosaur World. To the right is a small theater (built into a giant rock!) where you can sit and watch an informational video. If you visit on a hot day, this would be a great place to cool off for a bit. Opposite the theater is a large play area. This area has picnic tables and seating for adults. If you think you may have a hard time getting your child to leave the playground, just take a left when you enter Dinosaur World. This will lead you to the indoor museum area. If you explore in a clockwise direction starting here, the playground will be your last stop. The kids can play and you can rest. By that time, you will need it! The museum is quite dark so skip this part if you have a fearful child. It is a small area so viewing the exhibits won’t take long if you choose to go in. When you exit, there is a large “Touch and Tell” exhibit. These are covered boxes where your child can try to guess the contents. There is nothing yucky in the boxes so don’t worry about letting your kids have some ‘hands on’ fun! There are lots of picnic tables here. Dinosaur World does allow you to bring in outside food and drink so pack a picnic lunch and make a day of it! The next place to stop is the Fossil Dig. This attraction is included in admission for kids age 3-12. If you have older kids who want to try it, there is an additional fee. The dig is only done at specific times. We arrived a bit late but a really nice employee in charge of the area let my kids have a turn anyway. Continuing through the park, you will find a great prop for photos. It is a dinosaur head that you (or your child) can climb in! Once you finish your photo shoot, head into the Boneyard. This large enclosed area allows your child to dig for big fossils. There are brushes and other tools available to play with and a nice seating area for parents. Are you ready for the main attraction?!?!?! This hike will lead you on a paved pathway through Dinosaur World. At every turn, you will see huge replica dinosaurs. There is lots of signage with information about each kind of dinosaur. Some are individual displays and some are in large groups. The displays are so unexpected and surreal that we just couldn’t wait to see what was around the next turn of the path. As you travel around the Dinosaur Walk, there are two detours. The first is the Mammoth Garden. This is a small enclosed area with mammoths on display plus a large information board. The second detour is Photosaurus. This is the gigantic dinosaur that you can see from the interstate. No trip to Dinosaur World would be complete without a picture of the kids with Photosaurus. 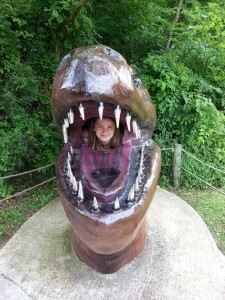 Find more fun nearby at Lost River Cave, Kentucky Down Under, and Beech Bend Park!